Jean Prouvé Compas direction desk in natural oak and chocolate brown metal for Vitra. 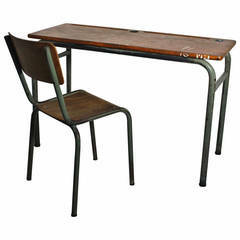 Originally designed in 1953, Prouvé's iconic desk is based the design on the structural principles for which he is known. Common to all of them are the slender, elegantly splayed legs, which call to mind the hinged arms of a compass – 'le compas' in French. 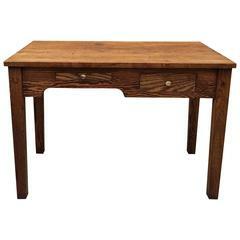 The oiled solid wood tabletop gives Compas Direction an individual touch. With its compact dimensions, the desk is ideal for the contemporary, largely paperless home office. 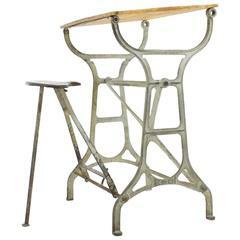 Available in various types of wood, and the metal frame comes in different colors. Price is per item. Current configuration shown is natural oak and chocolate brown powder-coated metal. Also available in smoked oak and walnut. Bent sheet and tubular steel frame available in smooth powder-coated Japanese red, deep black, chocolate brown, coffee brown and ecru color options. Please specify wood/color combination when ordering. Prices vary. In-stock lead time 11-12 weeks. Please note that inventory can change at any time. Can take up to 20 weeks or more. For time sensitive orders, please inquire prior to purchasing. Made to order. All sales are final.